It’s once again time to open our Call for Entries for Theme Art! Our theme for 2019 is “Trip to the Moon”. Ideal submissions will include elements that bring the aesthetics of space travel and lunar exploration from both science and fiction together into a modern graphics package that resonates with our Element 11 community and culture. All appropriate submissions will be displayed and put to a community vote held online in mid-January 2019. 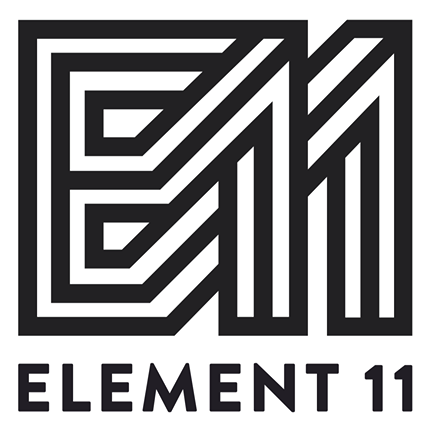 The winning submission will win 2 tickets to Element 11 2019. Since this art will need to be used in multiple applications, it needs to either be ready to modify digitally, or recreated manually in at least these 3 different size and layout iterations: Ticket (666 x 1764 px), laminate badge (888 x 1317 px), and booklet size (3337 x 6000 px). As an example, we’re including this image from one of our submissions for last year from retired Board of Directors member, David Born. Additionally, please make sure your design is of print quality resolution, 300 dpi. If you’re still not sure what all of that means, we invite you to reach out either to Element 11, or to ask or collaborate with one of the professional graphics designers you may already know. Please email your completed submission to art@element11.org no later than midnight, Sunday January 6th 2017. Thank you! We’re excited to see what everyone comes up with!